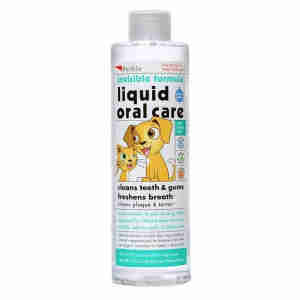 Petkin Liquid Oral Care provides an easy way to keep your pet’s teeth and gums clean and healthy while freshening breath. Simply add Liquid Oral Care to your pet’s daily drinking water. The virtually tasteless and colourless formula works invisibly to clean teeth while fighting plaque, gum disease and odour causing germs. Shake gently before use. Add 1/2 capful of Liquid Oral Care to every 8 ounces of drinking water. Prepare fresh drinking water every day. You will start seeing results in as little as 2 weeks. Use daily for best results. Note: Most pets accept Liquid Oral Care right away. If not, try adding 1/4 capful per 8 ounces of water the first few days until your pet fully accepts. Not for use in dogs and cats less than 6 weeks old. Great product works well to help clean teeth, thanks for such a fast service . Excellent product - having discovered it will continue using it as it definitely does maintain good oral hygiene.